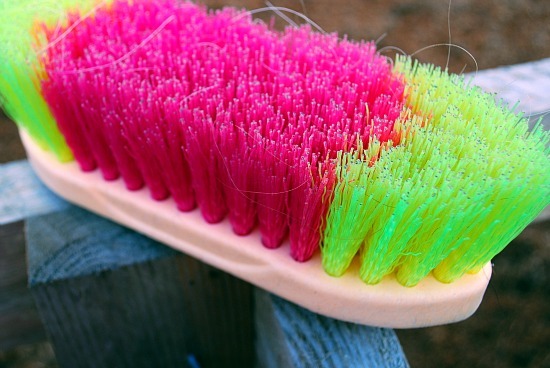 There are literally hundreds of brushes you can get for you and your horse, but as they site’s about “basic horse care” this is the minimum I’d recommend you have…. Curry comb: A tool made of rubber or plastic with short “teeth” on one side, that slides onto the hand of the groom. 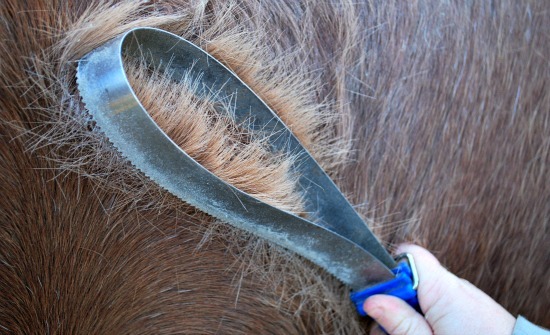 It is usually the first tool used in daily grooming. The horse is rubbed or “curried” to help loosen dirt, hair, and other detritus, plus stimulate the skin to produce natural oils. For me this is my most used brush – it is one of the few things that will get dried mud off, you can also use it to start combing through your mane and tail. It is however not advised you use it on the horses legs and face. Dandy brush or Hard-bristled brush: A stiff-bristled brush is used to remove the dirt, hair and other material stirred up by the curry. Body brush or Soft brush: A soft-bristled brush removes finer particles and dust, adds a shine to the coat and is soothing to the horse (pictured above). Shedding blade: My husband calls this my torture device although I can assure you the horses quite like it and it’s a useful piece of kit. It really comes into its own when my horses start malting. If you use a brush, their fur inevitably clogs the brittles up. If you use this in the direction of the coats fur, it gets loads off – you have to do it over a period of time though, as sometimes it can take weeks for a horse to shed it’s full coat. It’s also really useful for stubborn caked on mud! You’ll also need a good comb for the mane.